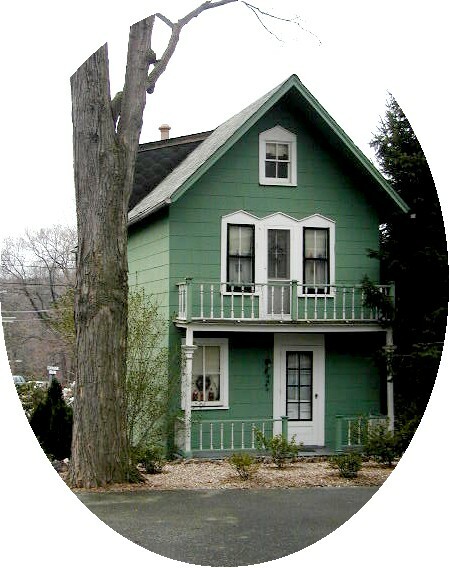 In the 1870s and 1880s this cottage, described as “a neat appearing structure, in perfect keeping with its elegant surroundings,” was owned by Lucy C. Young of Belvidere. In the basement of the cottage was the Mount Tabor Book and Stationery Store, originally run by Rev. Mr. Cronce. Note the pointed arch windows on the 2nd and 3rd floors of the Trinity Park facade. The double porches would have made this an ideal spot for listening to the camp meeting speakers. Click here for a map of the Historic Section of Mount Tabor.